Shockingly this is another film that seems to never get the limelight that it deserves. Thankfully Twilight Time has honored this film with a wonderful new 1080p High Definition transfer on Blu-ray. The movie looks amazing on this new outlet. I have always felt this was an underrated movie. It has a phenomenal cast of performers and the story sticks with you long after the end, at least in my viewpoint it does. It's a film both brutal and eye opening of reality. A personal side of drug addiction and love. Mixing both into a spiral of challenges and ultimate outcomes. The plot is simple yet very complex. Bobby is a heroin addict and hustler. His life is drugs. Helen finds Bobby passionately and ends up becoming an addict herself. As you would guess the relationship is a spiraling series of ups, downs and ultimate ends. A touchy subject, drugs and love mixed together. This is based on the book by James Mills. Mills is to me one of the great American Novelist to ever grace the world of writing. Not only an author but screenwriter and journalist. His ability to capture subjects and make you apart of them is a natural talent that creates the beauty of his ability to give a story life. You feel his characters and ultimately you feel like your apart of the ordeals happening. One of my favorite books by him is Report to the Commissioner which also has a movie adaption. A great writer, I have read three of his books and he knows how to bring a story to life in so many vivid ways. Needing no introduction to the film is the main star. The one and only Al Pacino. An actor that truly bleeds truth and believability in any role he does. Starring as the role of Bobby he gives you a moving, deep, and disturbing performance. A powerful role inside a powerful subject. Next I would have to mention the amazing and beautiful Kitty Winn who gives an unbelievable performance that stands out above and beyond. An award worthy performance in my viewpoint. It shocks me she no longer performs in film. She had such a natural reality to her parts. And the part of Helen is one of those defining roles. She did win the Best Actress award for The Panic in Needle Park at the Cannes Film Festival. Also starring a wonderful character actor that I feel never got his push to stardom that he deserved, Alan Vint, always a character actor. It was great seeing him in this film. I have often thought he was an amazing performer. Also starring the amazing Richard Bright another actor that never got the stardom he deserved. He like Vint created so many interesting side characters in films. They are two that made you remember them. Another fantastic performer in The Panic in Needle Park is Kiel Martin. I will always remember him from the 1980’s TV series Hill Street Blues. Another fantastic performer in this is Warren Finnerty. Another wonderful actor that should be remembered. Also starring Joe Santos who is another amazing character actor. The amazing mastery actor Raul Julia, I still can’t believe he is dead. He was such a brilliant performer that left the viewer satisfied in any role. Sadly, everyone I mentioned, Vint, Bright, Finnerty, Santos, Martin, and Julia are all no longer with us, and that’s a shame, wonderful actors. The Panic in Needle Park was directed by a wonderful director. A director that in my viewpoint should be a household name. He brought such great films like 1970’s Puzzle of the Downfall Child. The amazing 1971 film Scarecrow also starring Al Pacino. Jerry Schatzberg is a director that can bring his films to a beating heart of reality. He makes the viewer feel for the characters, and also in a sense giving a 4D reality as if you’re going through it. An amazing film director that I speak highly off. Now what is interesting and amazing at the same time is the film does not use any soundtrack, no music, giving it that haunting reality based feel as if life is unfolding before your eyes, or that your next to Bobby as he takes his next hit. The makeup and effects are brilliant. Interesting to note is the reality base feel of the injections of the needles, it was really done, actors pushed the needles into their skin to give it a real feeling. I think that is one of the beauties of the film, the darkness that it shines with, in that giving the viewer the sense of everything that these characters are going through. This film is a very intense exploration of drug use and it’s shown in a totally brutal and realistic atmosphere. Interesting to note the United Kingdom banned the film for years. Germany gave it an X rating. To me this is one of the best films to depict the reality of drug use in a natural feel and setting. The performances by all, are some of the best in film. This has never looked or sounded any better. An amazing transfer and dynamic audio. Twilight Time always honors films with high quality Blu-ray. Crisp sound, vibrant video. Simply put perfect. Isolated Score Track (featuring Unused Music Composed and Conducted by Ned Rorem). What is so great about this special feature, is it never was in the movie, but we are thankfully given this unused music as a special feature which is brilliant considering I have never heard it, which was a true treat. The music is done by Pulitzer Prize winning composer and diarist Ned Rorem. An amazing musician. He is a true one of a kind and listening to his music brings a sort of emotional roller coaster inside you. If you ever get a chance, try and seek out his music and listen to the soul and beating heart of music. He captures the wonderment of a musical soul. Panic in the Streets of New York in a little over 25-minute archive of the film with interviews by those involved. Writers in Needle Park is a little 9-minute interview with Joan Didion. Notes on Ned Rorem’s Unused Score is a little over 2 minute behind the unused score. Yet again I praise Twilight Time Blu-ray for bringing out an excellent choice for Blu-ray. This is one of those films that should be watched, should be remembered and thankfully Twilight Time has done that. I highly recommend this Twilight Time Blu-ray, for it is a must. 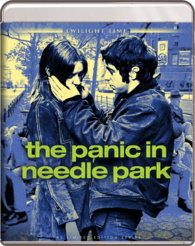 Twilight Time tends to never let me down if showcasing a variety of important films and The Panic in Needle Park is one of those.